Your Swan River cruise starts in central Perth, where you’ll board your boat and set off down the river. Listen to onboard narration as you admire views of the city skyline, waterfront suburbs and yacht clubs, making your way toward Fremantle, a port city on the other side of the river, where it meets the Indian Ocean. 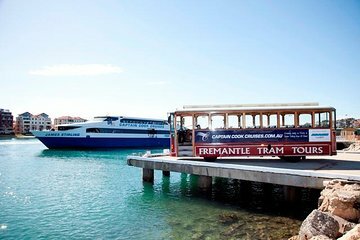 When you arrive in Fremantle, hop aboard a sightseeing tram tour to see its historical attractions, and then rejoin your cruise to return to Perth. Dine on a buffet lunch before you arrive back in the city, where your tour ends.